If you’re a science fiction fan, you know that Warner Bros. posted the official film trailer for Blade Runner 2049. But you may not have noticed that the trailer features the Atari logo. The trailer has both amazing and disturbing imagery of the future, with Ryan Gosling as a new Blade Runner, or agent who hunts down clones that have gone rogue and turned against humans. Harrison Ford is also returning to his role as Deckard from the first film. GamesBeat’s Jeff Grubb noticed that the Atari logo appeared in the trailer. No Blade Runner 2049 game has been announced, and perhaps the logo is simply there to evoke a sense of realism and the past. So it could be a very interesting product placement, or an ad for Atari. Or it could be a sign of things to come in terms of games. Or maybe it just means that Blade Runner 2049 is taking place in some kind of virtual reality, or an alternate version of our universe. I look forward to finding out. The film debuts on October 6 in theaters. One of our readers, Darren Tabor, pointed out that the original film also featured the Atari logo. Update: Mystery solved. Fred Chesnais, CEO of Atari, said in an interview with GamesBeat that the appearance of the Atari logo in both movies is the result of a product placement deal. 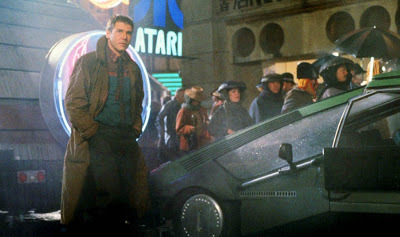 Atari is not making a Blade Runner game. Above: The Atari logo in the original Blade Runner.